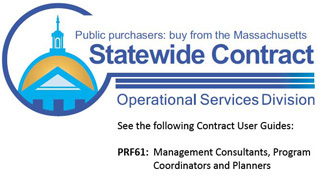 Peeler Associates is proud to be a Massachusetts Statewide Contractor for professional development services on Statewide Contract PRF61. Peeler Associates specializes in the design, customization, and delivery of leadership development programs including executive coaching, team coaching, leadership training, leadership assessment, and facilitation. We develop individuals and teams to meet the complex challenges and demands of leadership. We believe that our focus on leaders allows us to be the best at what we do. Training programs to cultivate emotional intelligence, effective communication, creative leadership competencies, and positive organizational culture. State and municipal government leaders face unique challenges. Call us today to find out how we can help individual leaders and teams in your agency or department meet these challenges by growing their leadership capacity.